What impact does the UK’s membership of the European Union (EU) have on immigration and asylum? This post examines that controversial issue, looking in turn at migration to the UK by non-EU and EU citizens. It’s central to distinguish between non-EU and EU migration in the referendum debate for two reasons. First of all, because while EU migration is obviously closely connected to the UK’s membership of the EU, non-EU migration is not. That’s simply because the UK has negotiated and used opt outs from EU laws on non-EU migration and asylum, particularly from the EU’s borderless Schengen zone. This means that the UK can control its borders with the rest of the EU as regards non-EU citizens, applying its own law to admit them or to refuse them entry. 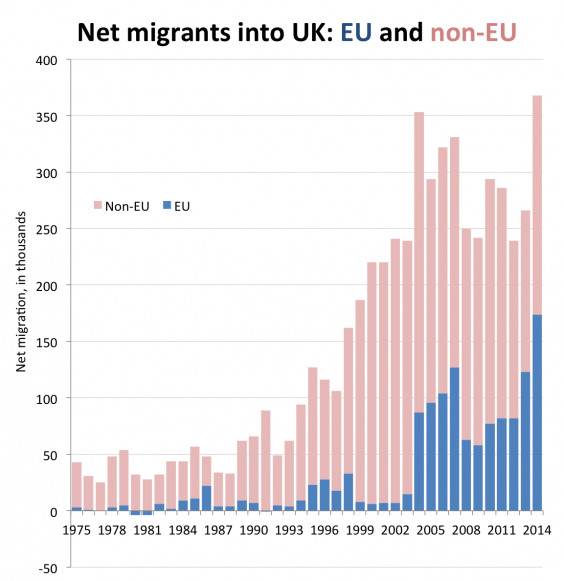 So it’s false to say that the UK has ‘lost control of its borders’ as far as non-EU migration is concerned. As I noted in the first EU Referendum Briefing, these opt-outs could only be removed by a Treaty amendment which the UK government and parliament agreed to. Moreover, the Schengen opt-out can only be removed by a public referendum. Moreover, for those who would like to see net migration to the UK reduced to the level of (say) 50,000 or below 100,000, it is self-evident from this graph that leaving the EU will not, by itself, accomplish this. Even with no EU migration, non-EU migration alone would still be well above the 100,000 level, as we can clearly see. Conversely, some would like to see more non-EU migrants admitted to the UK. Fine: the UK can admit them any time it likes. It’s entirely the government’s decision not to. But doing so would clearly move the UK further away from a target of 100,000 migrants, even if the UK leaves the EU. A small minority of non-EU citizens in the UK are covered by EU law. First of all, non-EU family members of EU citizens are covered by EU free movement law. However, the UK’s renegotiation deal (as discussed here) would allow it to restrict their numbers considerably, by tightening the rules on their entry. Secondly, the UK opted into the ‘first phase’ of EU asylum law, in 2003-05. At that time, though, it had a veto over asylum law proposals, and used it to insist that the EU rules would not change UK law. Although the ‘Leave’ side claims that the EU court ‘controls Britain’s asylum system’, in fact the only British asylum cases which the EU court has decided concern the ‘Dublin’ system of allocating responsibility for asylum applications between EU countries. This system allows the UK to insist that other Member States take back asylum-seekers who have entered their territory before they got to the UK. If the UK left the EU, it would no longer be subject to these Dublin rules, unless the EU agreed to sign a treaty with the UK to that effect. This is pretty unlikely, since the EU has only signed such treaties with countries like Norway and Switzerland, for the sole reason that those countries also signed up to be part of the Schengen area at the same time. Let’s think about what all this means in practice. Some non-EU migrants who have travelled through the rest of the EU do attempt illegal entry into the UK, or would probably like to do so (those in Calais and Dunkirk, for instance). But why would that change if the UK left the EU? The people concerned wouldn’t suddenly lose all desire to come to the UK. Their intended illegal entry would not become harder in any way. It would be against the law – but it already is now. Brexit would not actually move the UK further away from the continent geographically. People do attempt illegal entry into non-EU countries, like the USA; and refugees flee to and stay in non-EU countries (like Turkey, Kenya or Lebanon) too. Some on the Leave side have suggested that the UK is vulnerable to sexual assault from non-EU migrants on the continent. Let’s unpack that. None of the non-EU migrants concerned have the right of entry into the UK. The UK can simply refuse them entry at the border. In contrast, the Orlando killer was a US citizen, who could have come to the UK without a visa, on the basis of the UK’s visa waiver for US citizens. It’s sometimes suggested that non-EU migrants in the rest of the EU will all gain EU citizenship and come to the UK shortly afterward. But as shown in three separate analyses – by Full Fact, BBC Reality Check, and Open Europe – gaining EU citizenship is very difficult for non-EU citizens. It requires a long wait, a clean criminal record and satisfaction of many other criteria. If non-EU citizens don’t have legal residence status, or their asylum application fails, they can be deported. Nearly 200,000 non-EU citizens are in fact expelled from the EU every year. No one on the poster has any right to enter the UK. All of them can be refused at the border. Brexit would change nothing in this regard – besides making it harder to remove to the EU those who do manage to enter illegally and apply for asylum. The prospect that many of them would gain EU citizenship and move to the UK is remote. 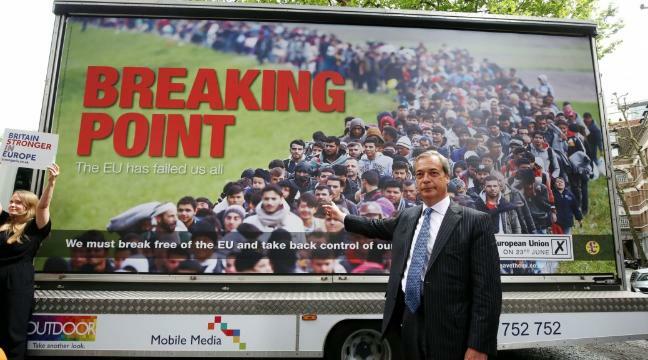 So the poster is essentially unrelated to the referendum. As such, it is not an attempt at rational argument - but rather an appeal to irrational fear. In contrast, as noted already, the migration of EU citizens is indeed relevant to the referendum debate. Much of this debate is about the economic impact of EU migration, including its impact on public services. I’ll leave that side of the debate to the economists. But there are some important legal issues that should be clarified, related to access to benefits and exclusion on grounds of criminality. The key point is that the free movement of EU citizens, while generous compared to ordinary immigration laws, is not unlimited. What are these limits? First of all, EU citizens have to meet the criteria to stay. The main legislation on the free movement of EU citizens – known as the ‘Citizens’ Directive’ – provides that EU citizens and their family members can move to another member state initially for a period of three months. But it also says explicitly that the EU citizen has no right to any social assistance benefits during this time. Indeed, the UK has removed EU job-seekers’ access to job-seekers’ allowance during the first three months of their stay. After three months, the Citizens’ Directive says that EU citizens and their family members can stay subject to further conditions: they are either workers or self-employed; or have ‘sufficient resources’ not to burden the social assistance system, along with health insurance; or are students in a post-secondary institution, if they have health insurance and declare that they will not be a burden to the social assistance system. The EU court has confirmed that there is no right to stay just to obtain social assistance without ever working in the host country. Recently it also confirmed the UK government’s refusal to pay child benefit or child tax credit to those who did not qualify to stay. It’s sometimes suggested that ‘500 million people can move to the UK’ under EU free movement law. Yes – if there were 500 million jobs for them to come and do. Or 500 million university places available. Or if all of those 500 million people had a small fortune stashed away. Obviously nothing like those numbers of jobs, university places or self-sufficient people exist. What about EU migrants who come to the UK and look for work? David Cameron has suggested they can be automatically removed after six months if they don’t find work. This isn’t correct: the Citizens’ Directive says that they can stay if they ‘can provide evidence that they are continuing to seek employment and that they have a genuine chance of being engaged’. But as mentioned already, they are not entitled to any benefits from the UK while looking for work. Also, they must meet the criteria of self-sufficiency, otherwise they would not be entitled to stay after three months anyway. What if an EU migrant works in the UK for a time, then becomes unemployed? It is possible that they can retain status as a (former) worker, and therefore keep access to social assistance benefits. There are limits to this, however. In particular, if the EU worker has been employed for less than one year in the UK, he or she would only retain ‘worker’ status for six months after becoming unemployed. At that point the UK can cut off access to their benefits, as the CJEU has confirmed. Workers are entitled to equal treatment as regards benefits, including top-up benefits paid to those in work, which are a large part of the UK tax and benefit system. However, the deal on the renegotiation of the UK’s EU membership specifies that if the UK votes to stay in the EU, the current EU rules will be changed so that the UK can apply a four-year ban for workers from other EU member states on in-work benefits. There renegotiation deal also says that the UK will be able to limit on the child benefit exported to EU workers with children in other member states, fixing the rate of that child benefit to the cost of living in the country of the children’s residence. After five years’ legal stay on the basis of the Citizens’ Directive, EU citizens and their family members can obtain permanent residence status, meaning that they no longer have restricted access to social benefits. As for criminality, it is sometimes suggested or inferred that the UK cannot refuse entry or expel EU migrants on criminal law grounds at all. This is clearly false. The Citizens’ Directive allows for expulsion, entry bans or refusal of entry for those who are a threat to ‘public policy, public security or public health’. There are limits, however. Restrictions must be proportionate and ‘based exclusively on the personal conduct of the individual concerned’. People cannot be excluded on general preventive grounds, but on ‘personal conduct’ which ‘must represent a genuine, present and sufficiently serious threat affecting one of the fundamental interests of society’. British authorities can check on an individual’s police record after entry, and can also issue an entry ban preventing that person from coming to the UK in the first place. For those who are on the territory, there is greater protection against expulsion over time, but there is never any absolute ban on expulsion. It has been suggested that the EU court has prevented 50 EU criminals from being removed from the UK. This is false. Any such judgments were made by UK courts or the European Court of Human Rights. To prove that point, let’s look at a list of all the cases which the EU court decided on EU citizenship in the last five years. There are 53 cases, and only five of them concern expulsion or exit bans of EU citizens due to criminality. Of those five cases, just three concern the UK. e) child abusers can be expelled on grounds of ‘public security’ even if they have been resident for over ten years (I case). So in every single relevant judgment in the last five years, the EU Court confirmed that Member States could limit the rights of convicted criminals or terrorist suspects. The ‘Leave’ side has referred to another supposed EU court ruling, about the daughter-in-law of a terrorist in the UK. In fact there is no ruling in that case yet – only the non-binding opinion of an ‘Advocate-General’. And according to that opinion, the person concerned can indeed be expelled, if a British court believes that she is a risk to public security. It is also possible to expel EU citizens on grounds that they rely on social assistance. 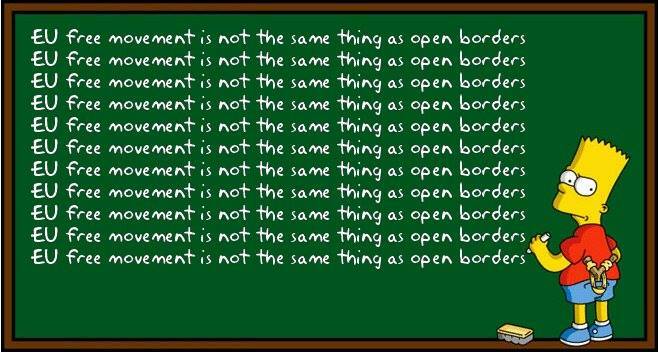 One final point about the free movement of EU citizens. The Leave side has referred several times to the possibility of Turkey joining the EU. It’s sufficient to point out, as I discussed in a previous Referendum Briefing, that: a) every Member State has a veto on this; Turkey has agreed 1 out of 35 negotiating chapters, in 11 years of talks; and there would also be a lengthy period after Turkish accession before the free movement of persons applied. So what is the status of all the people in camps in Calais? If they are non-EU why are they not returned to their countries? If EU they can come and seek work. Why are they stuck in Calais? The French government should either deal with any asylum applications they make or remove them if they have no legal ground to stay. They have no right to work unless they have an asylum application pending for nine months without a decision. They are obviously non-EU citizens otherwise they would just enter the UK by using their passport. Why would they suddenly stop trying to enter the UK if it left the EU? A Brexit would not mean that the UK moves geographically further away from the continent. Non-EU countries like the USA also have people entering illegally. There's simply no rational link between them and the referendum. Except that if they do make it in to the UK and apply for asylum, it will be more difficult to send them to another Member State since the UK will no longer be covered by the Dublin rules. They are stuck in Calais because they are not EU citizens. Being in the EU does not mean everyone can 'come and seek work' in the UK as leave campaigners suggest (like the poster behind Farage). Being in the EU just means that nationals of other Member States can come to the UK and work, pay tax, use NHS for free OR being asked to leave if they fail to find a job after certain time. If people in Calais are not deported, they are France's problem. Even if they enter the UK, there is a good chance that they are returned to France (though if UK left the Union, it would not have this option and would have to keep that migrant/asylum seeker, in some cases forever).